Here is a small family tree that I have constructed. The first part is the Grenan side, and the second part is the McLean side. Thomas R. Grenan was born in Ireland in 1817. He married Elizabeth Parker. Elizabeth Parker was the daughter of James A. Parker( b. 10/29/1791) and Mehetilda ?. Thomas R. Grenan and Elizabeth Parker Grenan had Pauline Grenan(b. 4/21/1837 -d. 2/4/1916). Pauline Grenan married Henry Rice Randall and they had a son, Harry Randall. Mark A. Grenan Sr. married Amelia Sophia Nagel. George Link(letter) married Margaret C. Hewitt( b. 10/5/1860 -d. 3/28/1957). They had Margaret Link(letter)( b. 11/11/1879 -d. 2/4/1941) in Brooklyn, NY. 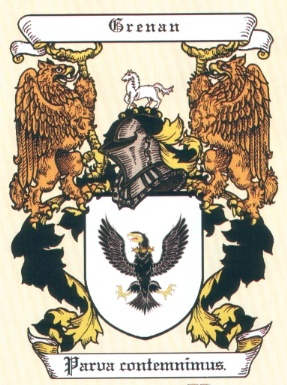 Mark A. Grenan, Jr. and Margaret Link(letter) had John Joseph Grenan( b. 6/14/19?? -d. 6/15/1963) in NY, NY. John Joseph Grenan died in St. Petersburg, FL. John Joseph Grenan married Isabell Simpson, whom was born 1902 in NY and died in NJ in October, 1988. John Joseph Grenan and Isabell Simpson had John Mark Grenan on April 14, 1927 in Bronx, NY. He died Sept. 14, 1989 in Dearborn, MI. John Mark Grenan married Colleen Ann McLean on June 30, 1951. Colleen Ann McLean was born Feb. 14, 1930 in Detroit, MI. John Mark Grenan and Colleen Ann McLean had John William Grenan on April 30, 1952 in Detroit, MI. John William Grenan married Irene Guzik. Irene Guzik was born August 16, 1946 in Hamtramck, MI, at St. Francis Hospital. She is the daughter of Joseph Guzik and Francis Szpyra. Joesph Guzik was born in Latrobe, PA and Francis Szpyra was born in Hamtramck, MI. John William Grenan and Irene Guzik had Shaun Christopher Grenan on April 12, 1980 at Providence Hospitol, in Southfield, MI. Here is my grandmother's family to bring the two halves together. Albert McLean married Theresa Devin. Albert McLean and Theresa Devin had John Albert McLean in 1908 in Detroit, MI. He died in Tucson, AZ in 1939. John Albert McLean married Lucille Maretta Rule in 1928. She was born June 10, 1908, and died May, 1949 in Tuscon, Az. Lucille Maretta Rule was the daughter of Albert Rule and ?. Albert Rule was born 1888 in England, and died in 1948 in Detroit, MI. Thomas Grenan in the census of June 6, 1841 for Greater Seaham, England. Biography of John McLean, Scottish Explorer! Grenan Castle, built in the Time of King John. Another mention of Grenan Castle, in Thomastown, Ireland. A page mentioning "Grenan Lands"
Charles Grenan came over on the SS City of Antwerp to New York in 1871. He was a 30 yr old Laborer from Ireland. 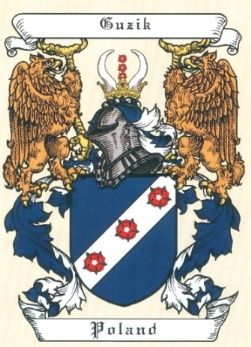 The Denns of Grenan, in 1247. In 1803 18 yr. old John McGrenan(a house servant) from Taughbone, Ireland came to Philadelphia aboard the Mohawk. The Mohawk departed from Londonderry, Northern Ireland, on on April 23, 1803. A special thanks to Barbara Mendes Jurs, Marie Grenan, Ann Grenan, and Peggy Moloney for helping me fill in the family tree!